Yesterday afternoon I was in Sunnyside as a work crew was setting up for ContainR. ContainR is an initiative with a Calgary connection, Nicole Mion. It started during the 2010 Winter Olympics in Vancouver. It is also part of the Fluid Movement Arts Festival, which is organized by Springboard Elevating Performance Company. There are a number of events connected to the Fluid Festival around the city between October 16-26 which mostly take place in theatres and exhibition spaces. ContainR is a village of pop-up venues made up of redesigned and repurposed shipping containers. ContainR is a gathering place and urban park with demonstration gardens, local food, kiosks, library, and incubator and experimental work spaces. containR presents events and performances. containR nurtures creative minds, artists, thinkers, growers, and entrepreneurs and builds community. 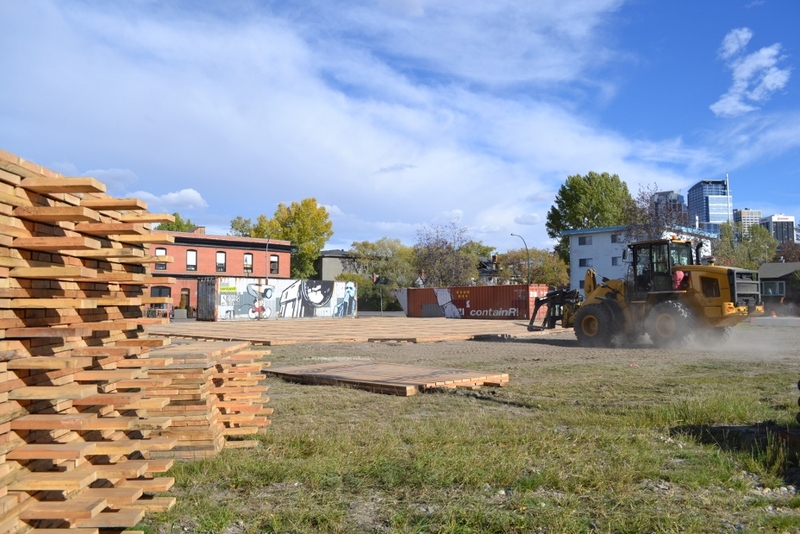 This Saturday there will be a number of events at their temporary location at 2nd Avenue and 9th Street NW which is about two blocks away from the Sunnyside LRT station. For those with a creative bent, there is a chair-making competition using hand-tools and prizes given for beauty, comfort, originality and a people’s choice award. The wood is provided and all that is required is the work to transform the material into something interesting. Registration takes place on Saturday morning between 7:00-8:00am with judging taking place at 4:00pm.